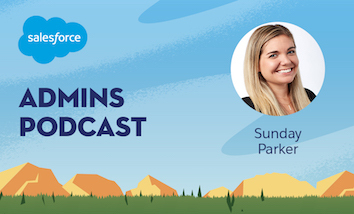 Today on the Salesforce Admins Podcast we’ve got Sunday Parker, Accessibility Evangelist at Salesforce, to kick off a two-part series focused on building accessible apps. What is it like to use Salesforce if you can’t see what’s on the screen? What if you can’t use a mouse or keyboard? We look at what you can do to help, and how that can improve the experience for all users. Join us as we talk about how to start thinking about accessibility in your org and how you can get the conversation started. This podcast is accessible! The full show transcript is below the show notes. You should subscribe for the full episode, but here are a few takeaways from our conversation with Sunday Parker. Abilityforce and joining the Salesforce Accessibility team. “Very quickly after I started with Salesforce, I became part of our first ever resource group for employees with disabilities,” Sunday says, which meant working very closely with the internal accessibility team. From there it was a simple transition to start working with them full time. The Ohana group for accessibility is called Abilityforce. “Ohana groups are what we call employee resource groups at Salesforce,” Sunday says, “which are different intersections within different groups in our organization.” We’ve previously covered AsiaPacforce and BOLDforce on pod if you’re interested in learning about other Ohana groups. Simple ways to get started with accessibility. “Accessibility is about ensuring that people with disability have full and equal access,” Sunday says, “so if we’re talking about a physical environment that may mean ample space for a wheelchair user like myself to get around, but if we’re talking about the web or a mobile application that may mean something different.” A user who is blind and uses a screen reader is going to interact with the web differently, and we need to be sure that we’re building products that will allow them to still use the platform in a way that works for them. One of the first things you can do is test with a keyboard. “Oftentimes, if your application is accessible to a keyboard, it means that a screen reader is also able to digest and interact with the content,” Sunday says. Another basic consideration is color contrast. “Millions of people around the world are low vision or color blind, and keeping an eye out for that high contrast can really help in making the user experience great for everyone,” she says. How accessibility benefits all users. “You do not need to be a person with a disability to advocate for people with disabilities,” Sunday says, “so look out for ways within your company and your role that you can influence accessibility.” Ask questions and get the conversation started. “It’s not that people aren’t trying to do the right thing, it’s just that they don’t know how to start,” she says. People with disabilities are the largest minority in the US, so it’s also a good business move to open up your content to more users. If you’re interested in getting involved, you can get started with the Trailblazer community Admins With Disabilities. If you’re a user with a disability and you have feedback, please reach out because we’d love to get you engaged in our user research efforts. We’re also releasing Trailhead content around accessibility, so look out for that and get educated. 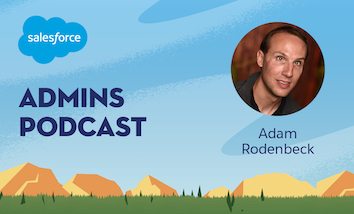 Gillian Bruce: Welcome to the Salesforce Admins podcast where we talk about product, community and careers to help you become a more awesome Salesforce admin. I’m Gillian Bruce, and today ladies and gentlemen, we are kicking off a very special two part series focused on building accessible apps. Gillian Bruce: Now, when you think about accessibility there might be a few things that come to mind, but here’s what I want you to think about. What is it like to use Salesforce as someone who cannot see what’s on a computer screen? What’s it like to not be able to use a mouse to click through? Those are just two very, very clear examples of what it means to think about accessibility when you’re thinking about apps. It’s a very different user experience. Thankfully, we have some incredible experts here at Salesforce who are focused on making sure that we build Salesforce in a way that everyone can access it. I wanted to share what they have taught me in my journey learning about accessibility, which has been amazing, and I have so enjoyed learning about all the different technologies, all the different considerations. Gillian Bruce: I wanted to take their expertise and share it with you, because admins, as we build apps, we need to make sure that everyone can use them, whether they’re our users, or our customers, or just in general. It’s very important that we make sure that everyone can use our products. Sometimes you’ll realize that if you focus on accessibility and optimizing that experience for someone who maybe can’t see or can’t physically touch the keyboard you’re actually gonna drive more sufficient processes overall for your application for power users. Gillian Bruce: Okay, so there’s your little taste. Get ready, because we’re kicking off this two part series by talking to Sunday Parker who’s an accessibility evangelist here at Salesforce. So, without further ado, let’s welcome Sunday to the podcast. Sunday, welcome to the podcast. Sunday Parker: Thank you so much for having me. Gillian Bruce: Well, I am super happy to have you on because this is a topic that I have just been learning about myself, all about accessibility, and I am so happy to have you here to help expose our admin office to what accessibility means both within the context of Salesforce, and just kind of in general. So, I wanted to introduction you a little bit to our audience with a question I ask all of our guests. Sunday, what did you want to be when you grew up? Gillian Bruce: Okay, that’s totally fair. Sunday Parker: I think I switched off every other year as wanting to be something else, whether it be a firefighter, or a singer, pretty much everything. Gillian Bruce: So, you were interested in a lot of different things. That’s great. So, interested in a lot of different things, how did you find yourself as part of the Salesforce ecosystem? Tell me a little bit about that journey. Sunday Parker: Yeah, so I started at Salesforce about two and a half years ago in technical support, so I was a support agent for Pardot. Gillian Bruce: Oh yes, Pardot a little marketing cloud action, I like it. Sunday Parker: Yeah, and I … very quickly after I started with Salesforce I became part of our first ever employee resource group for people with disabilities, and I worked a lot with our internal accessibility team, and I was able to finally transition over to the team last July. Gillian Bruce: Well, congratulations on the new role. Gillian Bruce: I know that … so, Abilityforce is the name of the Ohana Group, right? We’ve talked a little bit about Ohana Groups on the podcast, but can you give a brief overview for what an Ohana Group is at Salesforce? Sunday Parker: Yeah, so Ohana Groups is what we call employee resource groups at Salesforce, and employee resource groups essentially are different intersections with different groups within our organization. So, Abilityforce is our employee resource group for people with disabilities. Gillian Bruce: Got it. Yeah, we talked about I think Asiapacforce, and BOLDforce on the podcast, so it’s fun to learn about another group. Sunday Parker: Yeah, and we love all working with each other as well, so we’re all here for the common goal of bringing awareness on diversity inclusion in technical. Gillian Bruce: So, I want to back up just a little bit. How did you find yourself working in a technical support role, ’cause I know a lot of admins, one of the common stories that we find is a lot of us ended up in these roles without a clear, “I want to work at Salesforce when I grow up.”, kind of like we take these weird circuitous routes landing to where we are. So, tell me a little bit more about that specific journey for you. Sunday Parker: Yeah, so I actually studied interior architecture and design, so nothing related to tech, but I started working in tech after I graduated college, and trying to figure out what I wanted to be when I grew up. Gillian Bruce: I think we’re all still working on that, right? Sunday Parker: Yeah, so I heard about Salesforce, I worked on Salesforce at a previous company, but I heard from a friend who’s an engineer here at Salesforce about joining and how lovely the experience was for him, and how he thought I would be a great fit, so I applied. I always feel like I hit the lottery when I joined Pardot, because it was just such an amazing team. They were an acquisition from a few years back, so it kind of felt like a startup, but it was part of this great organization of Salesforce, but we had our own little family. Gillian Bruce: Yeah, that’s great. So, tell me a little bit about learning Salesforce. So, you say you started using Salesforce maybe as an end user. What was that learning experience for you? Sunday Parker: Yeah, so I think a lot of folks will align with this, I was kinda just thrown in as a role and as part of that I had to keep up to date with our Salesforce system, and I really never had any formal training, so anything I needed to figure out it was basically just Googling to figure out what was the best way to do it, and I was probably really slow going. I’m sure there are better experts at working in Salesforce, but I never imagined that I would actually end up working here. Gillian Bruce: Well clearly you did something right. So, the platform is so wide and expanded, I mean I think all of us battle a little bit of that imposter syndrome of thinking that, “Oh, we don’t know all the things somebody else does.”, but clearly you know enough and you’ve done quite … I mean, you’ve done an amazing job, now transitioning into this role as well. Let’s talk a little bit more about accessibility. So, what is accessibility, kind of high level? Sunday Parker: Yeah, so accessibility is really about ensuring people with disabilities have full and equal access. So, if we’re talking about a physical environment that may mean ample space for a wheelchair user like myself to be able to get around, but when we’re talking specifically about the web, or a mobile application, that can often mean something different. So, for example, a user who’s blind and utilizes a screen reader interacts with the web differently, but we want to ensure that we’re building products that will allow an individual to be able to still use the platform in a way that works for them. Gillian Bruce: So, that can mean a lot of different things. I mean, you mentioned screen reader, but … and you mentioned having physician space. There’s a lot of different levels of accessibility, so how does one … let’s say I’m an admin working at a large company, I’m still kinda getting to know the landscape, how should I start thinking about how to look for accessibility needs? Sunday Parker: Yeah, so I think if there … the best thing that you can do is really speak to people in your company if you have someone who’s vocal about the fact that they have a disability, asking them about their own personal experiences, if they have any challenges. I’ve often become this expert on all thing’s accessibility as it comes as my experience of being in a wheelchair. I’m certainly not, but I definitely do have that extra lens of my own experiences. So, it’s definitely great if you have someone within your company that you can actually speak to. Aside from that, getting involved with the HR side and seeing if they have any processes in place for employee accommodations or how your organization is really welcoming and being inclusive to people with disabilities. Gillian Bruce: Yeah, well, and I think that lens that you’re talking about is what I’m hoping this podcast inspires people to start thinking about, because I know after we first spoke a while back I started thinking about all of these things, and it just totally opened up a whole new world to me. I had not really thought about what accessibility means, and I think especially when you talk about building on the Salesforce platform and accessibility it can mean a lot of different things. So, when we’re specifically talking about the app, what are some … I mean, even just bucket at high level, what are some basic accessibility things that we should think about as we’re building on Salesforce? Sunday Parker: So, here at Salesforce we follow a set of web standards called WCAG 2.0 AA, it really rolls off your tongue. Gillian Bruce: I was like, that’s a great acronym. Sunday Parker: Yeah, so WCAG stands for Web Content Accessibility Guidelines. These are set by the W3C, and these are actually industry standards that you can follow that can really help in building accessible products. So, this is a global collaboration of folks that have set these standards, and this is really the best way to follow a clear set of guidelines to building accessible web or mobile applications. Gillian Bruce: We use that here at Salesforce to build our products, but we also want to enable our admins and developers who are listening to the podcast who are also building on the platform to do the same. So, I know we have some great Trailhead content focused on this specific … the whole idea of accessibility and how you can start thinking about it. What … I mean, I think what I would really be interested in finding is, what are maybe one of your … you talked about mentioning to people, talking to people, getting to know them, see what their needs are, what is one first glance thing you can do when you’re looking at your Salesforce app to make it a little bit more accessible? Sunday Parker: One of the things we recommend all of our designers and front end engineers to do is test with a keyboard. So, this isn’t always the case, but oftentimes if your application is accessible to a keyboard it often means that a screen reader is also able to digest and interact with the content. So, you don’t need to be an expert in a screen reader to be able to test your application, you can go through and see if you’re able to tab through and really interact, and that’s a good indication that maybe you’re on the right track. There’s certainly additional testing and considerations that need to go into it, such as color contrast, keeping an eye out for that, millions of people around the world are low vision or colorblind, and keeping an eye out for that high contrast can really help in making the user experience great for everyone. Sunday Parker: Yeah exactly. That’s actually one of the great benefits of building with accessibility in mind, is that it often creates an experience that is really better for everyone. So, not just someone who uses assistive technology benefits, but power users as well are able to really interact with the web in a whole new way, or a better way, more efficiently. So, it’s really great for everyone. 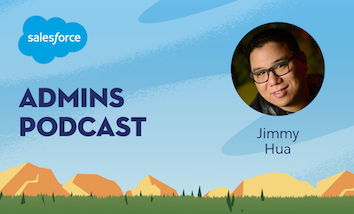 Gillian Bruce: Now, another thing I think we talked about briefly before this, we didn’t go into details I wanted to save it for the podcast, so Lightning is a relatively new thing in the Salesforce ecosystem. Well, not that new, I mean we launched it in August of 2015, but it’s new to a lot of our users, and Lightning, you kind of mentioned, is actually built with more accessibility in mind than perhaps classic. Can you talk to me a little bit more about that? Sunday Parker: Yeah, so we’ve really incorporated accessibility in mind from the start with Lightning. So, it’s really gonna be the best user experience for those using assistive technology will have a better experience on the Lightning platform. Gillian Bruce: That’s great. When I heard that it made me … it’s another reason to get people to move to Lightning. Sunday Parker: Yeah, there’s definitely additional considerations that someone building on the Lightning platform needs to keep in mind when it comes to accessibility, but we’ve attempted to make that as easy as possible to have that accessibility functionality implemented as much as possible. Gillian Bruce: Another question I wanted to ask you, since you’re one of the founders, I think, of Abilityforce? Sunday Parker: I wasn’t a founder, but I was very much in the beginning of the process of forming Abilityforce. Gillian Bruce: You were there in the very beginning, got it. So, that whole model is about creating a way to connect with each other within the same community, and also build allies. What is one of the things that … what’s a way that someone can be an ally, and how do you build allyship, especially for those who have different accessibility needs? How do you do that? Sunday Parker: Yeah, so I mean, Abilityforce has been a great opportunity to connect with end users both internally, our users with disabilities here at Salesforce, as well as getting engaged with the external community as well. So, we’ve built a lot of allies as well, just throughout various equality summits and engagements, both internally and externally, and what I always like to let people know is you do not need to be a person with a disability to advocate for people with disabilities. So, just look out for ways within your company, or within your role, that you can influence accessibility. If you’re not a designer, maybe you know someone that is, and maybe asking them, “Hey, how are you designing with accessibility in mind?” A lot of times just asking those questions can really start the conversation, and that can be really powerful. Sunday Parker: It’s not that people aren’t trying to do the right thing, it’s just they don’t know how to start, or maybe it’s just not something that’s top of mind. We’re all busy, we’re all working on deadlines, and sometimes we can forget to incorporate those different areas, but it’s really, really important as we’re moving towards a more inclusive world, that we’re not leaving behind people with disabilities. Gillian Bruce: That was said beautifully, and I also think when we talked about … for example, when we talked about tabbing through Lightning to do a demo, sometimes when you’re thinking about building apps in a more accessible way it actually improves the app overall for everyone, even people who don’t have the need because it makes it … I mean, it functions quicker, it’s easier to use, it doesn’t fail on you when your mouse goes out in a demo. Sunday Parker: Yeah, and people with disabilities are the largest minority in the U.S. So, one in five people have a disability. So, these are both your customers that are going to be using products as well as your colleagues. So really, accessibility is a right business move because it’s opening up your content to be accessible to more users, and we all want that, right? Gillian Bruce: Absolutely, we want more customers, we want more people to use our things, yeah absolutely, absolutely. So, you mentioned about building … doing some external allyship as well, and connecting with the external community, what … I mean, I know there’s actually a group in the Trailblazer community called Admins with Disabilities, which is great and I’m super excited we finally have content dedicated to that audience, what are some other external groups, maybe in the tech space that are good to get involved with if you’re interested in anything related to accessibility? Sunday Parker: Yeah so, definitely the Trailblazer community is the best place to start. We’re also trying to get more engaged with user research, so getting feedback from our customers with disabilities. So if you have that, please reach out on the Trailblazer community, and we’d love to get you engaged in our user research efforts, and also keep an eye out for Trailhead, we’re releasing new accessibility content as a Trail module. Gillian Bruce: That’s excited, I mean we love Trailhead, especially on the podcast, and so it’s great that we’re gonna have some content actually in Trailhead for people to access. To access about accessibility. Gillian Bruce: That’s excellent. Well Sunday, it’s been so fabulous having you on the podcast, but before I let you go, I have to ask you a lightning round question. Sunday Parker: Yes, go for it. Gillian Bruce: All right. No right or wrong answer, first thing that comes to mind, you ready? 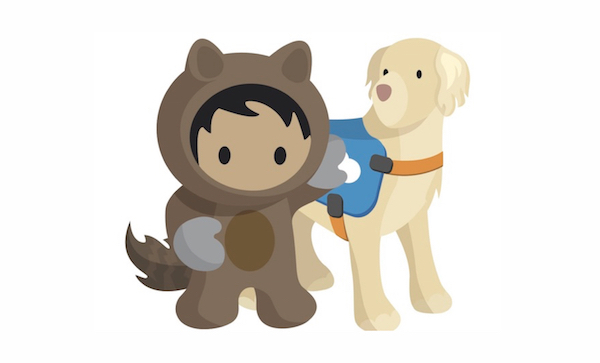 Gillian Bruce: Okay Sunday, most important question, who is your favorite Salesforce mascot? Gillian Bruce: Codey, why Codey? Sunday Parker: I just … I think he’s just tall. Gillian Bruce: He’s tall, he’s a bear. I’ve given Codey plenty of bear hugs, I can understand. Sunday Parker: Yeah, I mean he’s just so lovable, I mean. Gillian Bruce: I love it. Well, on that note, thank you so much for joining us, Sunday. I so appreciate the work you’re doing, and I’m so excited to continue partnering with you to learn how I can get more accessibility lens happening in my life, and I really am excited to see the community response to this podcast, so thank you so much. Sunday Parker: Yes, thank you, and I’m happy to guide you on your journey in any way. Gillian Bruce: Huge thanks to Sunday for taking the time to not only record the podcast with me, but to really help me understand and guide me through this journey as I learn what it is to think about accessibility in apps. Some of my favorite parts of our conversation is really learning about how important allyship is, and it’s actually not that hard to be an ally. I kinda got intimidated by the term, and the fact that Sunday called me an ally made me realize being an ally is really just asking questions and showing up. It’s not that hard. Gillian Bruce: Sunday was very clear about saying you need to talk to your users, you need to understand how they’re using Salesforce, if they have needs that are unique to them, talking to your HR department. There’s a lot of ways that you can really connect. Now, this isn’t that dissimilar from the idea of SABWA, right? Salesforce Administration By Walking Around. Make sure to connect with your users. Find out how they use Salesforce, find out ways that you can help improve that experience. Gillian Bruce: Now, when you’re talking about accessibility, I also really like that Sunday said there are some resources, thank goodness. So, there are some standards for the industry that you can absolutely access, we’re gonna put those in the show notes, and then when you start testing, some easy ways that you can test for initial accessibility is seeing if you can tab through an app. Pretend that you can’t use the mouse, and see if you can tab through and still use the app. Are there certain things you can optimize? Can you move things around on the page? This is a way maybe you can find an optimized experience, you can set up a custom profile for that specific set of users. Gillian Bruce: Also thinking about color contrast. So, there are standards out there that talk about best practices, but gray text on a white screen probably isn’t super easy to read, for those who can’t see very well. So, those are some simple first steps you can take, there’s plenty more. We’re gonna talk about more in our subsequent podcast next week with Adam Rodenbach, you’re not gonna wanna miss that. But also think about Lightning, if you are a company that may be still using classic, woof … this is another motivation to use lightning. So, Lightning really has accessibility builtin and it’s at its core. So, another impetus, another reason for you to get onto the Lightning experience. Gillian Bruce: Another thing that I think was really interesting is, Sunday talked about maybe if you’re making apps more accessible for specific users you might be surprised to find that actually derives more efficiency for power users. So, maybe power users find it’s a lot quicker to tab through a page versus clicking. Maybe that optimization that you drove for being able to tab through a page is gonna help them do their job faster, log calls quicker, close opportunities quicker. Something that’s really good for driving accessibility can be actually a better overall user experience. It was fascinating that Sunday said one fifth of people here in the US has some sort of a disability. So, we should all try to build accessible apps, because we don’t want to eliminate one fifth of our potential customer base, or one fifth of our potential user base, so building apps that everyone can use is definitely good for business. Gillian Bruce: If you want to get engaged and connect more with our amazing accessibility team at Salesforce you absolutely can online in the Trailblazer community. I’ll put the link in the show notes, and reach out, they’re always looking for feedback about how we can improve user experience for everyone. There’s also great Trailhead content coming soon, I know I mentioned in the podcast it’s available. Well, we have it here at Salesforce for employees, but it’s coming soon to everyone else, so stay tuned on Trailhead, we’re gonna have great content coming out. As always, you can find more great content about accessibility, we actually have a blog post coming out very soon about how you can optimize page layouts for specific users. You can find all that on admin.salesforce.com. You can also find other great blogs, webinars, events, and yes, even more podcasts. Gillian Bruce: Please make sure you subscribe to this podcast so you can get it delivered directly to your platform or device of choice the moment they are released. Oh yeah, and since we’re talking about accessibility, guess what, we’re now transcribing all of these podcast episodes. So, if you are someone who cannot hear you now have the ability to read the content, the interviews, that we’ve got going on in the podcast, and that is what Sunday asked me about in our first meeting, So hey, this is how you can be an ally. I’m proud to say that we now have a fully accessible podcast. Gillian Bruce: You can follow us online on all the social things. We’re on Twitter @SalesforceAdmns, no “i”. Our guest today was Sunday Parker. She is @sundaytakesbart, and myself @gilliankbruce. Thanks so much for listening to this episode. I’m so excited for you to listen to next week’s episode, as well. Have a great rest of your week, and we’ll catch you next time in the cloud.